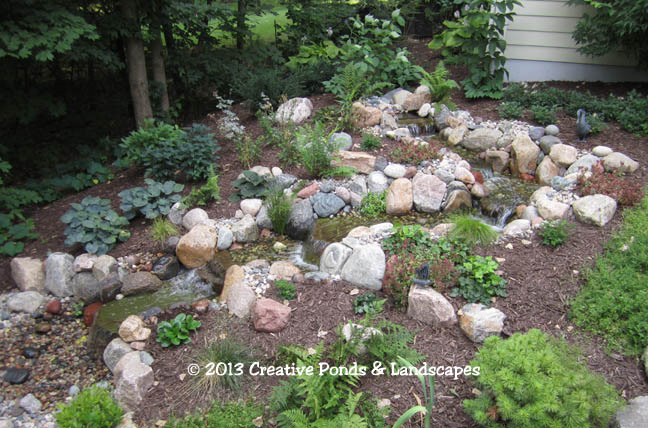 Pondless waterfall & landscaping in Chanhassen, MN. 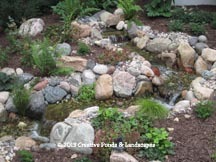 Pondless Waterfall In Chanhassen, MN. Creative Ponds & Landscapes is a pond & landscape contractor specializing in the installation of backyard ponds, waterfalls, pondless waterfalls, fountains, assorted water features, low voltage landscape lighting & landscaping in Minneapolis & St. Paul MN and surrounding Twin Cities area. Located in Chanhassen, MN. 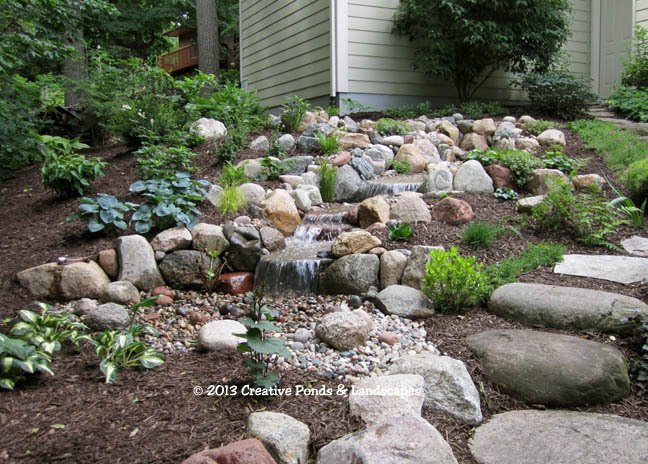 and installed in the Spring of 2012 this 20' long multi stepped Pondless waterfall & landscape installation brings life to a shady hillside that was impossible to grow grass on. It can be enjoyed from both indoors & from a nearby deck. 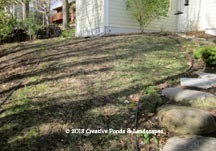 Over a dozen varieties of shade loving shrubs & perennials were installed to complete this shady backyard oasis. NEW! Clicking on the Before photo will open a page showing both the Before and After photos together. Click on a gallery below to view pictures and a profile of each installation. Click Here for Pond Gallery 1. Click Here for Pond Gallery 2. Click Here for Pond Gallery 3. Click Here for PondlessTM Waterfall Photo Gallery. Click Here for Artificial Rock Creations. Click Here for Indoor Water Features. Click Here for Fountains. Click Here for Retrofits & Repairs. Click Here for Seasonal Tour Of A Pond. Click Here for our NEW! Video Gallery.